Yesterday’s weather was just about perfect – sunny, warm, slightly breezy. All of which make grilling a great option for lunch. 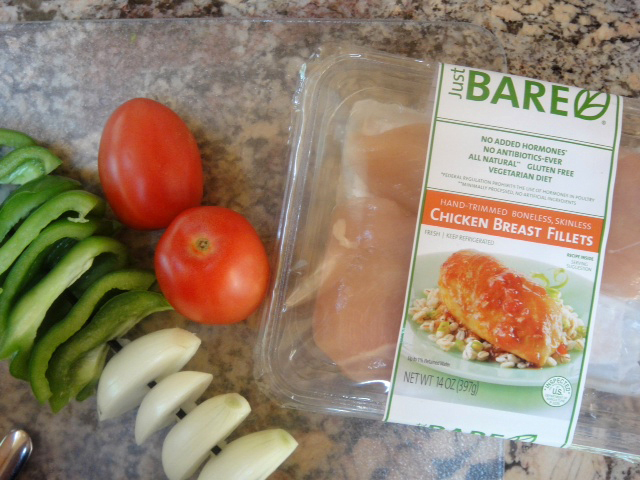 Earlier in the week I received a package of Just BARE Chicken breasts from Gold’n Plump, and I was excited to give them a try on the grill. Hungry for a healthy, but flavorful lunch, we made a grilled chicken salad loaded up with toppings. I was worried that a BBQ dressing might seem kind of heavy and wasn’t sure if I would like it as dressing instead of in its traditional sauce form. I based the flavors off of the mop sauce used at my favorite BBQ place in Texas – Cooper’s Old Time Pit BBQ. At Coopers, they dunk meat from the grill right into the sauce to give it a light coating of vinegary flavor and spices. Knowing that it is great for smoky bbq, I used similar flavors to create this light and low-calorie dressing. 1. I usually buy Gold’n Plump chicken, but this was my first time trying their Just BARE Chicken brand. They were terrific, especially for grilling. Tender and juicy as expected, these chicken breasts were very uniform in thickness and size, which made grilling them evenly much easier. I’d definitely use these again. 3. You may want to consider making the whole baguette instead of just half, it is quite popular and no one feels guilty for taking the last slice. In a small bowl, combine the first four dressing ingredients, stir to combine. Add remaining ingredients and stir until well mixed. Set aside. This can be made ahead. Season chicken with salt and pepper. Place green pepper and onion on a skewer. Using 1 T. olive oil, lightly brush sides of peppers, onion, and both sides of romaine. Season with salt and pepper. Using 2 T. olive oil, brush both sides of the baguette. Place peppers, onions and chicken on grill over medium high heat. Chicken will take approximately 5-7 minutes per side. Remove chicken, dice, and add to dressing. 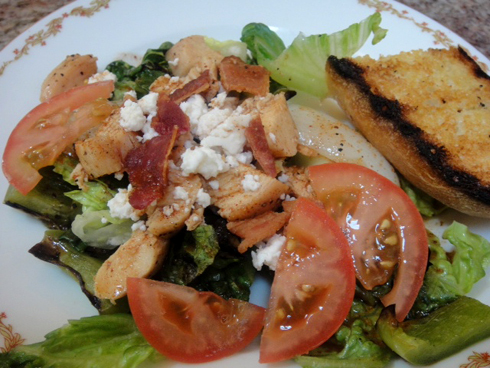 While chicken is soaking up the bbq dressing, place romaine and baguette on the grill, for about 2-3 minutes per side. Remove romaine, onions and peppers, and baguette. Rub the garlic clove over the inside surface of the grilled baguette, then slice baguette for serving. Sprinkle with salt and pepper, then set aside. Coarsely chop the romaine and divide between plates. Top the romaine with peppers and onions, crumbled bacon, roma tomatoes, and queso fresco. Remove the chicken from the bbq dressing and divide between plates, then drizzle some of the remaining sauce over each salad. Serve with grilled garlic baguette. One more note, Gold’n Plump has a Facebook page specifically for their Just BARE Chicken brand. On that page, they post all kinds of links to great recipes for chicken, sides, and tasty desserts. I’d recommend it.